by John Scalzi | Science Fiction & Fantasy | This book has not been rated. Ex-library trade paperback via mail order. 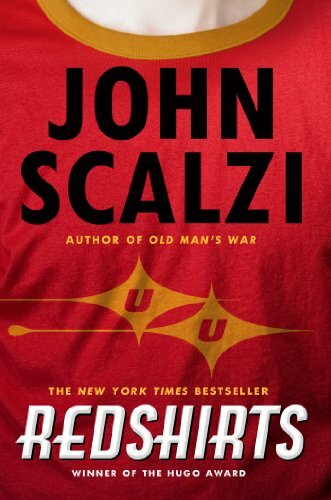 John Scalzi has become one of my favorite authors, and this book is really amusing (as is the audio version, read by, of all people, Wil Wheaton - there are a few passages that are particularly funny in that context). Basically, if you understand the point of the title, you'll probably enjoy this book, although it might warp your brain a little. Friday, December 22, 2017: hopefully this one doesn't take *too* long to get to Utah! Wishing you the best of birthdays, and hopefully a few chuckles from this book. Released for Davros-10's 2017 TV Challenge because although it doesn't *quite* say so (those pesky copyright issues) there's no question that this book was inspired by Star Trek. I did indeed have the best of Birthdays, hyphen8, which is why I’m late journaling .... I spent my entire birthday week (and then some) in Yellowstone! And then I get home and my b-day continues, opening so many terrific packages from generous bookcrossers~~ best of Birthdays! And as a StarTrek fan since it first aired way back when. ( I was in HS), I was SUPEREXCITED when I opened your package!! THANK YOU for sharing this book, for both books, and for the fabulous assortment of labels and release stickers! Awesome!! !